Tips, tricks and advice for Falcon players. One aspect of getting involved in Falcon that can't be learned or prepared for in single player is the configuration and use of voice comms. Here I attempt to describe basic and advanced configuration and use of IVC. In the "Sound Devices" section at bottom of IVC Client program, select your microphone in "Capture" list and speakers/headphones in "Playback" list. This is usually the only required setup step, and if you have the correct things set as the default devices to use then even this should take care of itself. We can add a Sidetone that will let us hear our own voice when we transmit. We use the "tone = " option in the .ini, and set it to "loop:#", where # is a number. To find this number, right-click on the volume icon and select playback devices. Click on your playback device of choice (here it is "Speakers"), and in the "levels" tab find your microphone. Each entry has a number starting from 0 at the top, and in this instance our microphone would be 1. Following the above, we would set our loopback in the .ini file using "tone = loop:1". We can also use "toneVol" option to raise or lower the sidetone volume. Usable values as defined in the manual are +6 to -6. I use "toneVol = +6". Setting "loudness = 1" adds compression to incoming audio, making it easier to hear other players. Using "outsiders = all" is the best option for listening to players who are in 2D while we are flying. Other options are detailed in BMS-Manual.pdf on pages 257-258. When connecting to the server, enter the IP address of the IVC server as well. Once clicking connect, the game should take control of the IVC Client window and connect to the IVC server automatically. For most users it's not necessary to touch the IVC Client window beyond the initial setup steps. 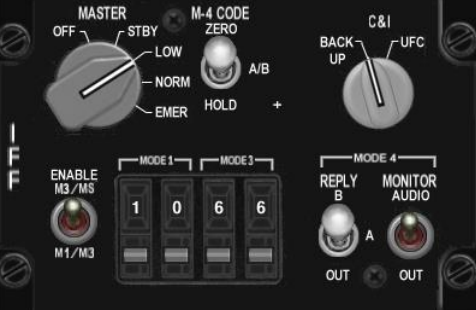 Once in-game and connected to the server in 2D, the F1 and F2 keys let us communicate by voice to others who are either in 2D with us, or in the cockpit and have their UHF radios tuned to preset 13. F1 will communicate with anybody in-flight who is on the UHF 13 preset, F2 is for 2D only. Make sure you use the right one, if you have a conversation in 2D using F1 then people in-flight will be able to hear you. None of this is useful unless everybody knows how stay in contact with everybody else. Members of each flight need to know what VHF channel to use to talk to one another, and multiple flights should know which UHF channel to use to coordinate with one another. We normally use preset channels for radio comms. By default the F16 has a frequency assigned to each preset, we don't normally change any preset other than setting UHF 15 to the tower frequency. To change preset using the ICP, press COM1 for UHF or COM2 for VHF and type in a preset, 1 to 20, and press ENTR. For most uses, UHF is set to 13 once in-flight to talk to other flights or to anybody in 2D. We use sometimes use frequencies when having radio problems, sometimes there are issues with somebody's presets and they have a preset assigned to a different frequency. To change frequency, press COM1 for UHF or COM2 for VHF and type in a frequency, without the decimal point. For example, to dial in the Kunsan tower frequency (292.3) we would type in 2923 and press ENTR. Once we're in the cockpit, we use the Comm switch to broadcast on UHF or VHF. When we do, either UHF or VHF will be highlighted in the DED depending on which one we're using. See the first "Keybindings for new players" post for more details on the Comm switch. Comm1 volume is for UHF, used mainly for inter-flight comms and for AWACS. Comm2 is VHF and is used for communicating with your flight. The tiny volume knob on the backup UHF panel balances the volume between AI radio comms and player voice comms. UHF guard frequency is 243.0 MHz, all UHF receivers also listen to guard frequency by default, making it useful if we need to transmit to as many people as possible. VHF has a guard frequency as well but people must choose to listen to it. We can transmit on Guard by switching either COMM mode knob to "GD". 87th Tripp made a good video on the backup radio. The goal of BVR is to kill the other guy without him killing us back. We'll start with the weapons. There are missiles like the AIM-7 that require constant radar guidance in order to hit their targets, and there are missiles like the AIM-120 that don't. The former is mostly useless and easily defeated. We only care about the latter type here. The 120 is initially guided through datalink from the firing aircraft, until it reaches the point where the missiles own radar can take over and guide it to the target aircraft. This doesn't always have to be the case though. If the firing aircraft cannot maintain missile guidance, the missile will attempt to guide itself using the target aircraft's last known position and heading. This makes the AIM-120 sort of like an air to air cruise missile. The upside and downside is that there is no launch warning. Newer enemy aircraft will have similar weapons available. You may get a hint or two if they decide to crank left or right after firing, but you must always assume that if you're within firing range then so are they. The only other way to know for sure is if the missile is already tracking you. How close is the target? Is it a MIG-29 or a Su-27/30/33/37? If the target doesn't go defensive before your missile begins tracking on its own, it will afterwards. How much energy will the missile have left when it reaches the target? When do we go defensive? Are there any friendly aircraft in the target area? Are we sure the target is an enemy aircraft? 1. If a peer adversary (one with similar capabilities to us) gets too close, we have to assume that it has already fired at us and take immediate defensive action. If it's further away we can assess the threat and engage it. 2. The RWR in the F-16 variants flown in the standard Korean theatre show both the MIG-29 and all Flanker variants with the 29 symbol. This is vital to keep in mind as the MIG-29, while still a major threat, is fairly simple to shoot down (Correction: later versions of the MIG-29 have access to the AA-12/R-77, which has a longer range than the AIM-120 as modeled in BMS and similar capability), whereas the Flanker has capabilities which rival our own and needs to be taken much more seriously. 3 and 4. The best way to defend yourself is to not be shot at in the first place. Other than that, the best way to defend yourself is to go defensive as soon as possible. We need to guide a missile and so does our target. The longer we guide it the better the shot quality will be and the more we put ourselves at risk, and this applies for the enemy as well. You might guide the missile for 5 or 10 seconds and hope it hits as you burn away, or you might choose to take your chances and wait as long as possible until you hear the RWR audio tone of an incoming missile. This also applies to the enemy. If we launch from too far away our missile will not have enough energy to catch the target when it decides to turn and run. 5. If we leave our outgoing missile to its own devices, it will attempt to find its way to the target and hit anything it sees. You may be tempted to help out someone who got a little too close to the enemy, but if your missile tracks him instead he's toast anyway. Again, this also applies to AI aircraft, so spacing and situational awareness can be very important as you don't want to take a missile that was meant for somebody else. 6. No clue, go and find out. We either have to rely on an AWACS declaration or use our targeting pod in air to air mode to gain a visual confirmation of our target. A third option is our FCR, which may be able to display aircraft type at the top of the MFD in certain situations, but don't count on it. At 25 seconds, a threat appears just as we make our fence in call, which delays our response. At this point, all we have is a 29 partially obscured by a friendly on our RWR. I could have used the TGT SEP button to separate them, but I didn't consider it necessary. 40 seconds: After the fence in call is taken care of, we need to find the threat aircraft. The RWR is fairly accurate at longer ranges, so all I have to do is search in the general heading. Once we find a contact in the right direction, we ask for an AWACS declaration, which my wingman receives first because I have text turned off and have to wait for the audio. At around 55 seconds I call for my wingman to go spread, and then give him permission to take a shot if he has one. At 1:13 you can see me switch to Track While Scan on the left MFD, which will let me fire on multiple targets if necessary. 1min 20: I pull up according to the steering cue and send a missile downrange. My normal criteria for a launch is below the circle on the range scale, but as a bit of a bonus the bar jumps upwards to account for our slight loft. After launch I immediately pull off to the right while maintaining lock on the enemy aircraft in order to reduce the closure rate to the enemy (and therefore the chance of being hit) as well as drag any potential incoming missile outwards into a lead pursuit and waste some of its energy. 1min 45: I make the decision to abandon my missile and go defensive with 6 seconds to go (M06, below the range scale), assuming (correctly) that I've been launched on and (incorrectly) that a missile would be stopping by to deliver mail shortly. It turns out I could have waited another ten seconds or so, but I didn't take any chances. When going defensive I dive down and away to force the missile into thicker atmosphere to waste its energy while maintaining moderate G (under 5) and speed (under 550kts) to avoid damaging stores or the aircraft and forcing an aborted mission. This defensive maneuver is also shown in a second video I'll put below as well. This move is not safe below 16,000 ft. over enemy territory, as MANPADS will take you down. This limits the effectiveness of the tactic and means we have to be even more cautious over enemy territory. At 2:35, the missile has been defeated and the enemy aircraft has been shot down by #2, though we don't know it right away. I turn back in prepared to re-engage and look around, while #2 eventually calls AWACS who confirms no more threat. Other times the only way you know for certain is when you look all over and can't find it anymore. Hopefully this will be of use, and will prevent people from dying while playing with military combat aircraft on the internet. Other BVR tactics are available, some of which require extreme bravery and testicle radius.